From the majestic top of Mount Teide, which is surrounded by fascinating lava streams, lava rocks and the ash beds of Teide National Park, to glimmering turquoise waters and shimmering sandy beaches, adventurers and nature lovers adore the island of Tenerife. A stay at Sunset Bay at Torviscas, close to cosmopolitan Playa de las Americas, provides all the excitement and relaxation one could desire. Breathtaking vistas combined with superb resort comfort create an exhilarating escape. Buying one of these Tenerife timeshare resales will quickly turn out to be your favorite decision. With so many experiences to discover, your toughest decision will be what to do first! In your choice of studio, one, two or three bedroom timeshare accommodations at Sunset Bay at Torviscas, everyone will love the convenience of a partial or fully equipped kitchen featuring niceties like a dishwasher, fridge with freezer, microwave, toaster, oven, coffee maker, glassware, utensils and dishes. An in-unit common area with television, DVD player and iPod docking in some units provide entertainment. 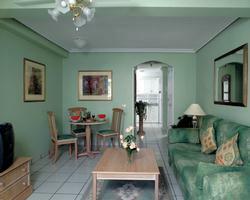 Relax indoors in air-conditioned comfort, or enjoy soft breezes from your terrace or balcony. Other conveniences include an alarm clock, safe, iron and ironing board. At your resort, enjoy outdoor pools, a delightful restaurant, snack bars, table tennis, ping-pong and pool table, a playground and poolside bar. Business amenities include wireless Internet and fax, along with a copier. Outdoor enthusiasts are thrilled by whale watching and water sports like swimming, snorkeling, scuba diving, windsurfing, sailing, boating and fishing. Sports minded visitors enjoy pursuits like tennis, golf, horseback riding, squash, renting mopeds for exploration, and swimming and spa relaxation to top off perfect days. You'll even find a bowling alley and casino for exciting variety. 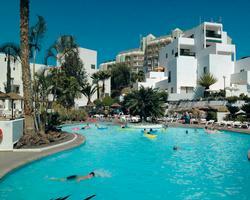 These Tenerife timeshare resales comes with plenty of benefits. Everyone will love the food and wine experiences available nearby, along with exploring the island's scenic villages and learning its fascinating history. Staying at Sunset Bay at Torviscas helps you see why over five million people every year have chosen Tenerife as their ultimate destination for relaxation and fun. Contact Sunset Bay at Torviscas Specialist Today! Days: Friday, Tuesday / Time: 5:00 P.M.